The Federal Communications Commission announced that it will shortly publish a Report and Order in the Federal Register that will eliminate the requirement that General and Extra class Hams pass a 5 WPM Morse Code proficiency test. There are those who think this is a good thing and others who think it will be the end of Ham Radio. Regardless of whether or not you were for the change, against the change, or just didn't care one way or another the debate is over. That ship has sailed and sometime early in 2007 the rule will be that no demonstration of CW proficiency is required to obtain any of the three US Amateur Radio licenses. The important thing is that current licensees accept those who come after the new rules go into effect as "real Hams." They will have met every legal requirement needed to become licensed. Our job is to Elmer the newcomers, expose them to as much of the good stuff as we are able, and hold them and ourselves to high standards by setting good examples of operating skill, technical accomplishment, and fellowship between Hams. 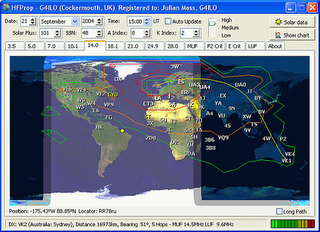 Back in July of 2006 I wrote about a simple propagation tool from G4ILO. Recently he's released a second tool called VOAProp that uses a more advanced prediction algorithm than the original HFProp. Read more about VOAProp and give it a try. Last week was our vacation to Tennessee and the Great Smokey Mountain National Park. We actually began the Friday before hand in order to arrive in Seveirville, TN so we could attend the annual Ten-Tec hamfest. I don't have the latest and greatest Ten-Tec gear but I do have an older Century 21. This was the rig all the Novice operators lusted over in the late 70's. Anyway, it was interesting to tour the factory and see the operation. 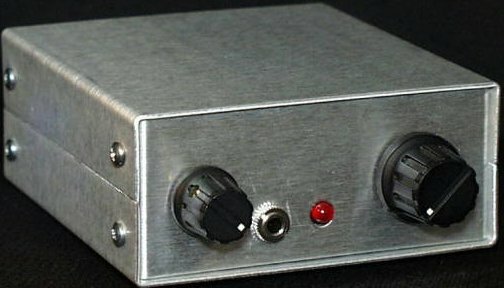 The Ten-Tec Hamfest is a real hamfest. 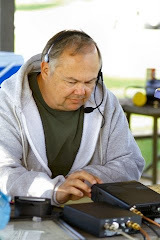 The rules stipulate that all items offered for sale need to be directly ham radio related. No beanie babies. No endless piles of old computer equipment. Just vendor after vendor with all manner of radios, antennas, and parts. Based on the turnout of sellers and buyers we saw I'd say it's a good formula. I wish other hamfests would adopt this same rule. Our plan was to spend a week relaxing in a mountain cabin and exploring the mountains. I took some HF gear along with the intention of doing some evening and early morning operating. Unfortunately Murphy tagged along and while the cabin and it's surroundings were very serene the location was plagued with an S9 noise level. I wish I could tell many tales of great mountain DX and long, relaxing rag chews but it just wasn't meant to be. The common RS232 serial port was once ubiquitous on any laptop or desktop PC manufactured. Many PCs came standard with not one but two of these ports. We used them to attach modems and sometimes printers to the computer systems. Often Ham Radio operators and other electronics experimenters used the power of the PC and the readily available serial port to create inexpensive or unique gadgets by individually controlling the pins of a serial port. Items like data aquisition systems, EPROM or microcontroller programers, machine controls, etc. were created. The serial port has vanished or is quickly vanishing from the PC of 2006 and beyond. Few commercial peripherals require a serial port and most newer devices use Ethernet or the now common USB port as their interface. What about all those cool gadgets we have lying around our shops and work benches? Perhaps we need a new type of USB to Serial adapter targeted at "non-traditional" applications. The adapter would interface to the PC via a USB port but the hardware side would have a small microcontroller and level converters that truly reproduced the voltage levels and input/outputs of the traditional 9-pin serial port. On the PC side of things a software driver would be needed to look for all the world like a standard COM port down to the register levels needed to twiddle individual pins on the port. That bit twiddling would be transparently passed back and forth via USB to the micro and level converters on the other end of the converter. The end result is that it could function as a normal serial port but low level programs like programmers and other control devices could also read and write individual pins on the nine pin port. Anyone who has participated in or helped run any sort of on line forum or BBS should get a smile out of this. Three to correct spelling/grammar errors. Six to argue over whether it's "lightbulb" or "light bulb". bulbs and therefore the posts are relevant to this group. for this technique and what brands are faulty. including all headers and signatures, and add "Me too". One group lurker to respond to the original post 6 months from now with something unrelated and start it all over again. Some times you're not interested in knowing how a watch works, you just want to know the time. I find it's much the same with RF propagation conditions. I want to use the radio to work another station but don't want to necessarily become a propagation expert to do it. Julian Moss G4ILO has a wonderful tool called HFProp. He sums things up pretty well: "HFProp was written to satisfy my needs for a program that would show me whether conditions are likely to be good or bad on a particular day on a particular band." HFProp is free to use although you might consider donating a few bucks to Julian for his efforts. I find that it's pretty good for figuring out useful things like when 17 Meters will be open to California from Illinois, when I can expect to start hearing European DX on 80, etc. About people who've "tried" Linux actually. I have no doubt that Linux vs. Microsoft debates will rage on for years to come. It disapoints me however when someone declares absolutely that one is better than the other with no supporting argument. How could anyone take those people seriously? Proclaiming "XYZ is better!" with no reasoning to substantiate their view is barely even an opinion. Of course, that's just my opinion. Lately, you read that more people who use a Windows platform have tried Linux. Some seem to give it a fair shake, others seem to quickly give up in frustration over one thing or another proclaiming "Windows is so much easier." For those that quickly dismiss Linux because Windows is easier I wonder how many months or years they've spent becomming accustomed to Windows vs. the amount of time they've spent learning about Linux. I use both Windows and Linux (Ubuntu) and like them both for a wide variety of tasks. If I were forced to only use one I imagine I could live with either for most of my day to day needs. Both have so many features, options, and possible configurations that I don't think a valid case could be made for saying either one is absolutely better in every single application and situation. Over the July 4th holiday I assembled a Wilderness Radio 30 Meter SST CW rig. This is a nicely done kit with great instructions. I asked myself "How hard could it be?" Well, I'll report back once I figure out why it won't transmit. I've checked and re-checked and have talked with "QRP Bob" Dyer on the phone for suggestions. I'm confident it will all turn out just fine. One comment for now is that Bob seems like a super nice guy and it's really a pleasure to deal with him. I'm looking forward to putting this on the air. It seems that somehow during assembly or initial power up tests I have managed to kill the 2N3553 final output transistor. I hate it when I do stuff like that! Anyway, a replacement is in progress and again Bob has been very helpful and patient through the troubleshooting process. With as common as email has become in our world today I would think people would take a bit more care in what they write. Post an original message or a comment to a mailing list and several things happen. First, usually within minutes, your message is sent to hundreds or perhaps thousands of people around the world. Second, it is probably archived without your ability to edit it somewhere for all to see for years to come. Hmmm. Let's think about that for a minute. Response 1: Why not actually help them? You don't necessarily have to go into a long detailed analysis of their question and a solution but you might point them to some resources that will let them find the answer they need. Just writing "Ever hear of Google?" is not a proper response. Response 2: Never miss an opportunity to shut up. Yes, I'm actually suggesting that if you can't be helpful or don't know the answer you just skip to the next message and say nothing. In this electronic age with nearly infinite amounts of storage the likelyhood of our words staying around for many years is certain. How do you want to be remembered? Nothing exciting here. I guess making your first blog post is akin to a computer programmer creating a "hello world" program in a new programming language.